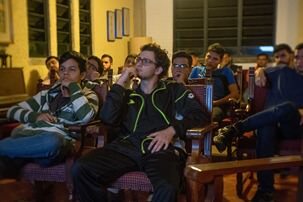 To contribute with DASH #1 goal, we will be lecturing young Venezuelans about DASH, helping establish a wider adoption, a major step towards making Venezuela the first DASH nation. Adding 1800 well informed members (Downloaded wallets) to the DASH Network. More than 20 merchants accepting DASH payments, using it as a currency and sticking with it. 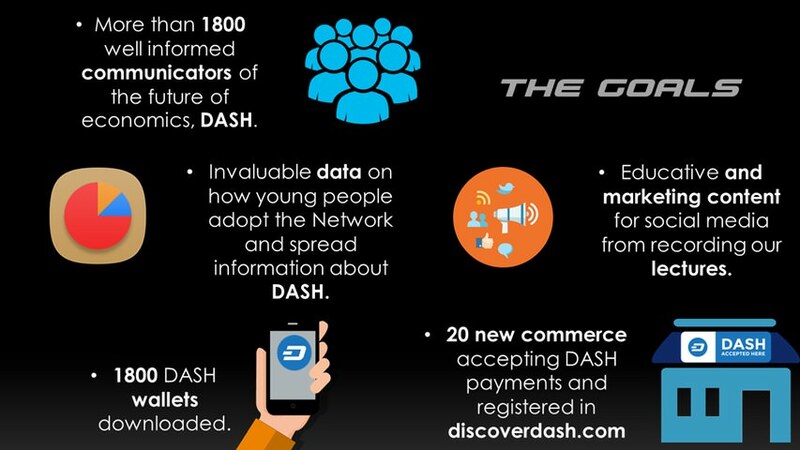 Collect invaluable data on how young people adopt the DASH Network, understanding them so they can be targeted with marketing strategies. This organization will focus on teaching about DASH to young students. As the validation survey showed that 85% haven’t heard of the DASH payment network. Additionally there is a high interest on receiving lectures about DASH. 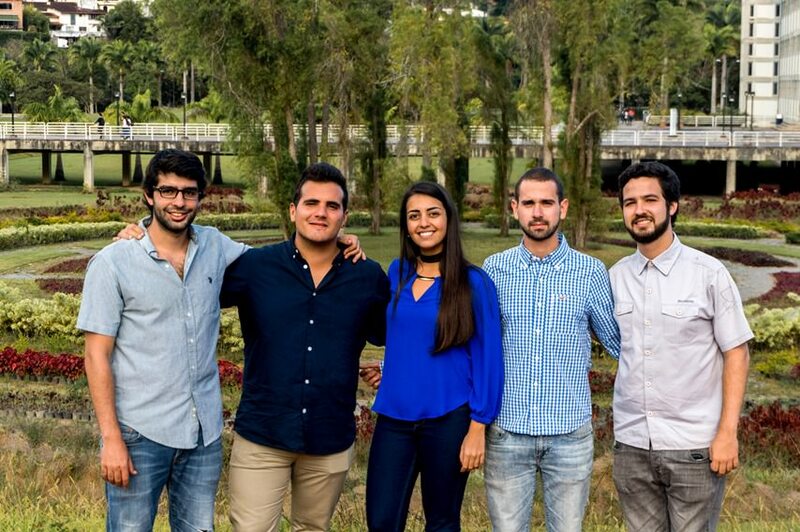 Dash funded projects will be promoted, such as DASH Caracas team lead by Eugenia Alcala (@algodonfranelas) who has run 5 successful conferences in Venezuela, and the Dash Help Support Center team lead by Alejandro Echeverria (@AlejandroE) who will be running the first Call and Support Center exclusive for DASH worldwide. Here we are﻿. Prepare young minds for a new and better economic system, helping them become massive DASH adopters. Provide updates and reports every month through Dash forum thread, Discord and our site﻿. Also videos of our lectures will be posted on our YouTube channel for educational service. Furthermore detailed information will be sent to the Dash Core Team. 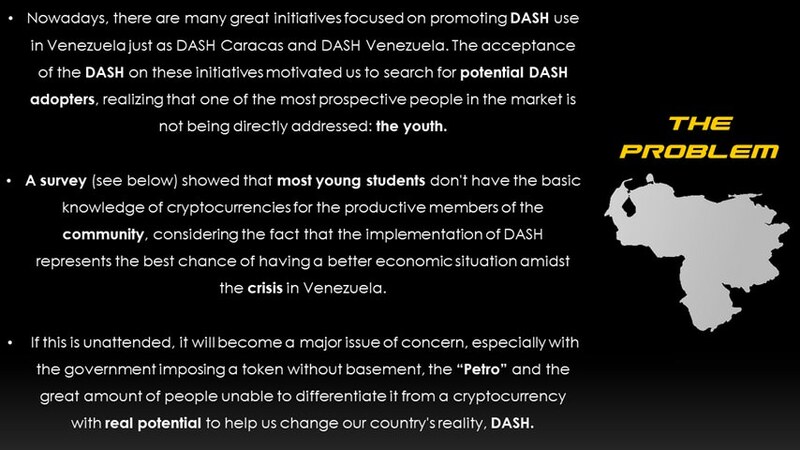 ﻿We are the DASH Youth Venezuela team and the following is to present our educational proposal for the DASH community. 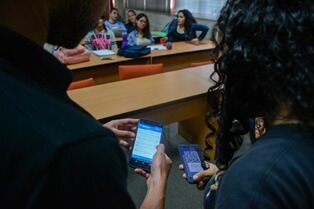 We will be reaching 1800+ students on 11 High Schools and 7 Universities of Caracas, Venezuela. We hope you like it, don't hesitate to ask any questions or suggestions you may have. The investment will be split in 3 months so our work can be seen before the completion of the funding. These will be 3 payments of 25.03 DASH for a total of 75.1. We are using the rate of the 14 of March, 2018(460USD/DASH). The selected DASH/USD rate is 460 $ (03/14/2018). In case of volatility we will add 20% more to the budget. ﻿What has been done so far. 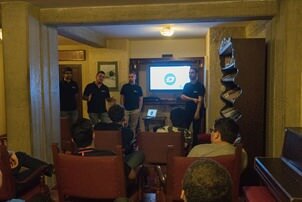 ﻿We held our first lecture and it went great, we got great reception and acceptance of DASH. The interest was such that after the conference we were requested to organize more lectures in the rest of their allied institutions. The event was carried out at the Monteavila Universitary Center (Centro Universitario Monteavila) in El Cafetal, Caracas, which holds mostly universitary students and many distinguished professionals. ﻿﻿Our second lecture was held in the materials engineering study hall of the Simon Bolivar University and it was solely directed to the students of such career. A contest in which participants had to post a comment in a post made in our Instagram account, where 20 dollars worth of DASH were given to a random lucky winner, showing the efficiency of DASH's instant sent payment system (They were all impressed). And of course, we were asked to do it in many other study halls! On Tuesday April 17th we visited Madison High School in Caracas, giving two of our discussion lectures for all the students of the 4th and 5th year. Also professors and other staff personnel of Madison High School assisted to both of our lectures. 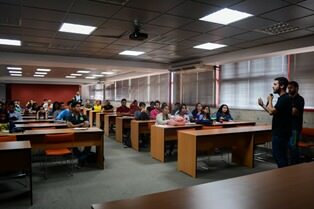 The audience was very interested and well trained about the topics. After the lectures, we had an experience with the students and the commerce of the School. Each of the persona that assisted to the lectures could buy their breakfast with DASH using their Dash Wallet. 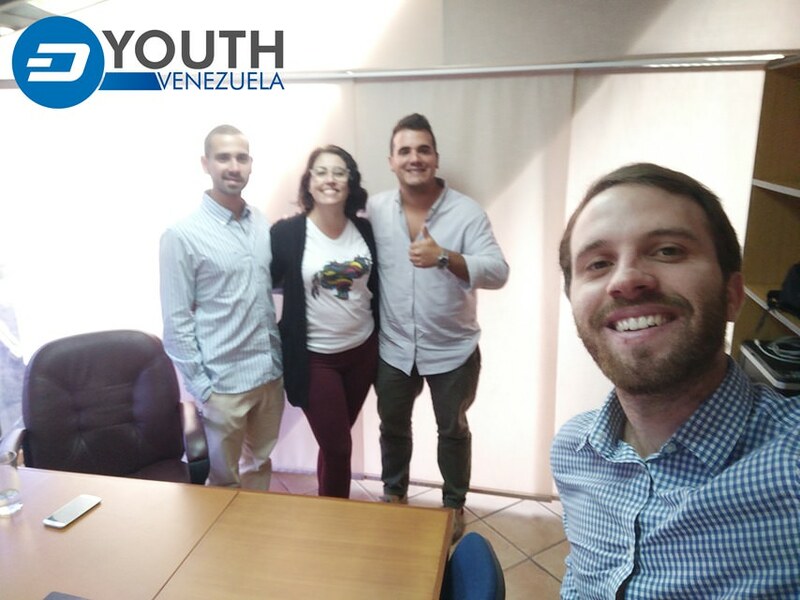 The Venezuelan youth has demonstrated their interest in learning about cryptocurrencies and Dash, and our organization is working to create spaces for their education. Last Wednesday April 18th we had our 4th discussion lecture in Caracas, in Universidad Central de Venezuela, one of the most important ones in our country and in Latin America. It’s interesting to see that in every activity we organize, the youth is willing to learn about the crypto ecosystem and its implications and benefits in Venezuela. Young people is naturally attracted to these global changes that are taking place in the economy. 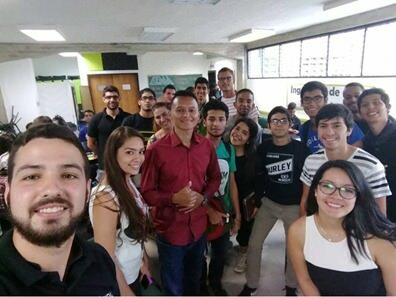 For this reason, we are always willing to offer quality information and education to discuss with the Venezuelan students about this financial revolution, and how DASH has demonstrated to be one of the best options for the Venezuelan society when talking about cryptocurrencies and financial independence. The most influential social network for our team is instagram since it is the most frequently used by the people we are targeting, the youth. 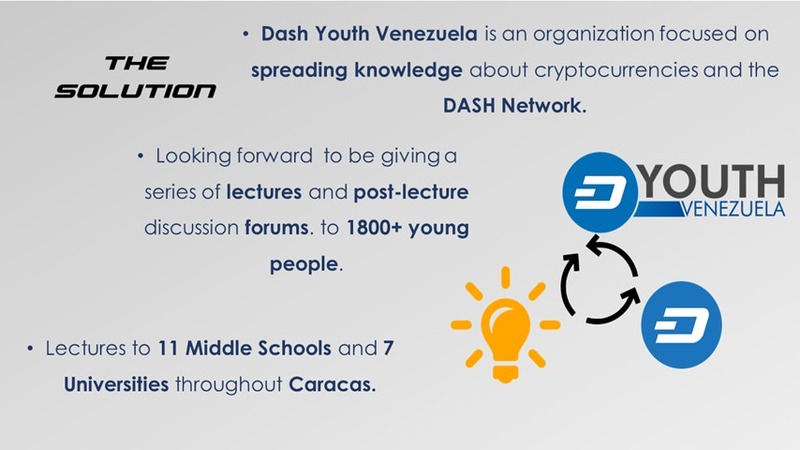 DASH Youth - Venezuela works solely as an educational organization for the DASH community. 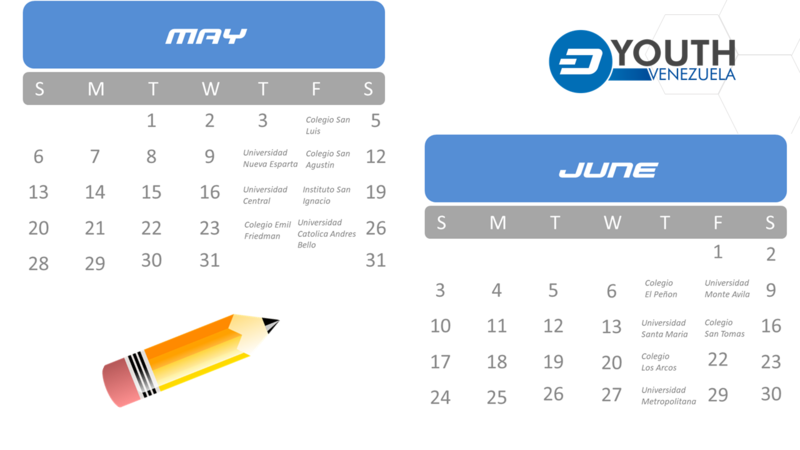 DASH Youth - Venezuela will not manage people’s DASH wallets, nor their DASH and other cryptocurrency funds. 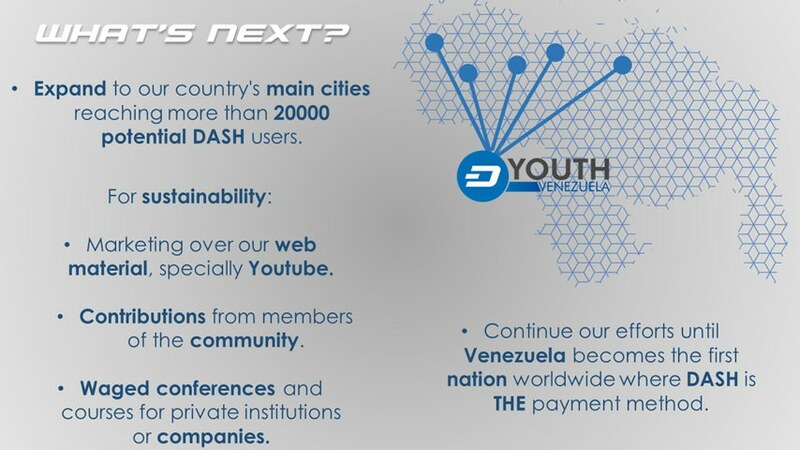 DASH Youth - Venezuela will not be held responsible for the misinformation people could get about DASH from communication channels different from the ones at DASH Youth - Venezuela. I actually dont really understand the purpose of this comment since we are neither auditors of proposals (that's DashWatch duty) and a lot of the proposals you are referring to are NOT from Venezuela. If you have any inquiries about our proposal or any othe in the Venezuelan DASH ecosystem I'll be more than glad to address your concerns. YES. right location. education combined with actual usage. This project is exciting. I voted YES two weeks ago. It is in the green! COOL!!!! Thank you very much for the continued support ec1warc1!! Yes from me. Very important work you are doing! Thank you. We are really happy to being official DASH embassadors. as I've already stated in your pre-proposal, easy YES Vote for me. Venezuela will be the first DASH Country! Dear AnCapitol, sorry for the late reply. We have been very busy getting everything ready to start operations ASAP. As always, thanks for the encouragement and support, hopefully we will be working together soon!! One of the main points of our lectures will be giving information about other projects that will help keep our audience engaged with DASH to increase the probability of they becoming frequent users. You can count on dash.red and other all other proposals relevant to this topic being promoted on our lectures! 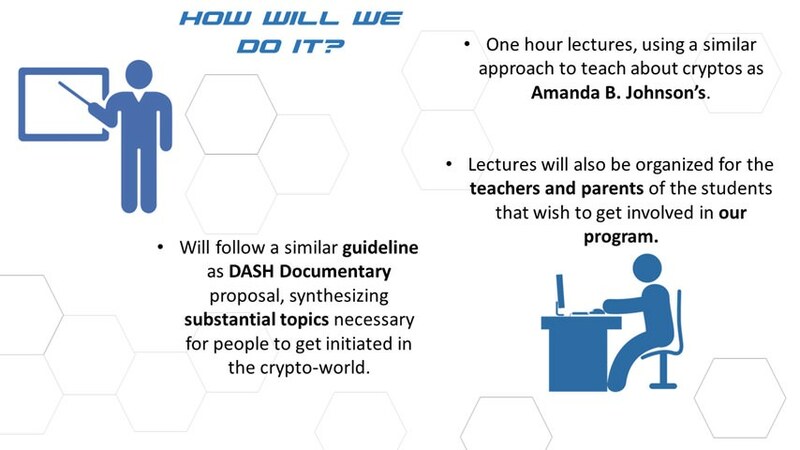 Get these kids to talk to their parents about Dash, sure, why not! Yes. Thanks! Thats part of the plan. 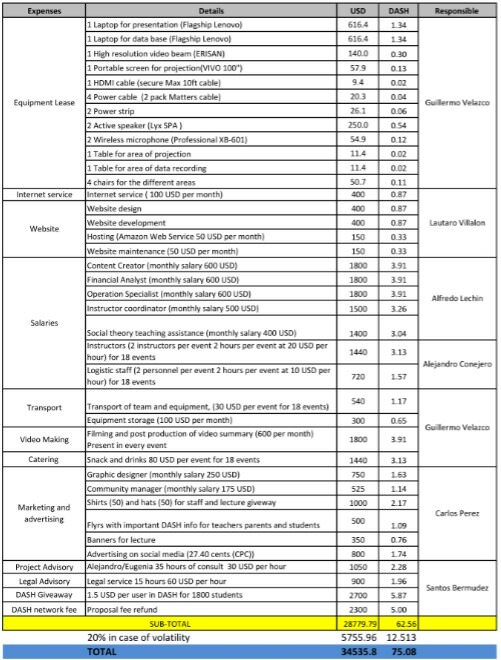 Right now, anything that might turn the crypto tides in Dash's favor in Venezuela has my vote....but do high schoolers and university students in Venezuela conduct much commerce in general? Are payment methods important topics to them? I want to be careful not to be spending $30,000USD on classes to children who couldn't participate if they wanted to. Hello, thanks for your question! Its important for us to clarify that we will only be going to private highschools, that translates to children with more resources with parents more willing and able to adopt DASH. This also applies to 5 of the universities we are visiting, the other 2 (Universidad Simon Bolivar and Universidad Central de Venezuela) we are targeting media a investors attention because those are the 2 most prestigious colleges of Venezuela. This team knows what they want and how to achieve it, and they have a good understanding of DASH functioning and how to communicate it to the younger people. I hope all MNOs read this pre-proposal and vote (hopefully YES). Excellent video. I would love to see a video in which you introduce yourself(s). I am hoping to see lots of video content from your work in the future: interviews with merchants, youth, etc. I followed you on Twitter and YT, but I couldn't find you on Facebook. Thank you very much for the suggestions! We sure appreciate them. Soon we will be uploading a video introducing the team, and after we start operations those interviews will be coming for sure. You bring a specific and detailed plan, and the price is right. Voting yes. You mentioned that you are training about "cryptocurrencies" however is this going to be exclusive training on how to use DASH or will you be using DASH funds to train the youth on other competing cryptocurrencies? DASH now is a 4 Billion dollar market. If Venezuela is to have an effective currency it needs just ONE currency to make it work. If you had multiple currencies it will cause issues with merchants because some may accept DASH and other may accept other currencies. I think I can speak for the DASH MNO in saying that DASH funds need to be spent only promoting DASH and no other competing cryptocurrencies in the promotion or in this case training. If Venezuela is to have a functional currency again it needs one currency. You are using the word "DASH" but then talk about training on cryptocurrencies can you clarify what you mean by this. DASH wants to fund DASH promotions. We are big enough now and our technology is advanced enough Venezuela does not need any other type of digital currency infact to have more than one will be a disadvantage on many levels. 1. message is much more difficult to transmit if you are speaking about multiple cryptocurrencies - why do that if DASH provides all you need? 2. If Venezuela chose to use DASH as its national currency then there is no problem with compatibility between different merchants and customers - everyone will accept DASH. 3. DASH network will support more readily DASH only promotions with DASH money so you, and other Venezuela projects are much more likely to get funding if you are focusing exclusively on DASH education and DASH promotion with our funds. 4. If the Venezuelan people all focus on using DASH your own holdings will be worth more money because more people are using it. IT also means the currency will be more stable because more people are using it. Can you provide more clarification on how exclusive your training is in respect to DASH and other competing "cryptocurrencies"
The fact is you do not need any other currencies one is enough and infact one is better. You need to decide which one you are going to commit to and then promote only that one. Is it going to be DASH? Hello Deepblue! Thanks for your great assessment and for taking the time to read our proposal. We completely agree with the fact that DASH is a massive crypto and that its reach is more than enough to cover all Venezuela. We are sorry it wasn't clear enough that we will ONLY be training the participants of our lectures on DASH. What we meant by mentioning other "cryptocurrencies" is that we will be saying they exist in order for us to be able to compare them to DASH so that people can see and fully understand the advantages DASH has over them. Hopefully that's more clear now! Once again, we deeply appreciate the time you are giving to our proposal and we are completely open to any advice/suggestions you may have about it. OK thanks for the clarification. 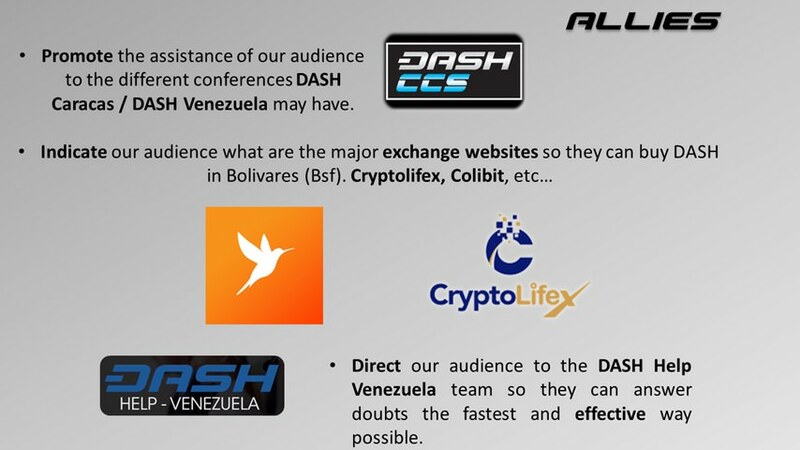 Could I also ask how is the DASH network going to be kept up to date on your project and what - if any connections do you have with the other DASH Venezuela projects? Our plan for keeping in touch with the community is based on the DASH forum and Discord, we believe that this is a crucial point since it will allow all of you to be assured we are delivering and give us invaluable feedback. About the connections, yes we do! 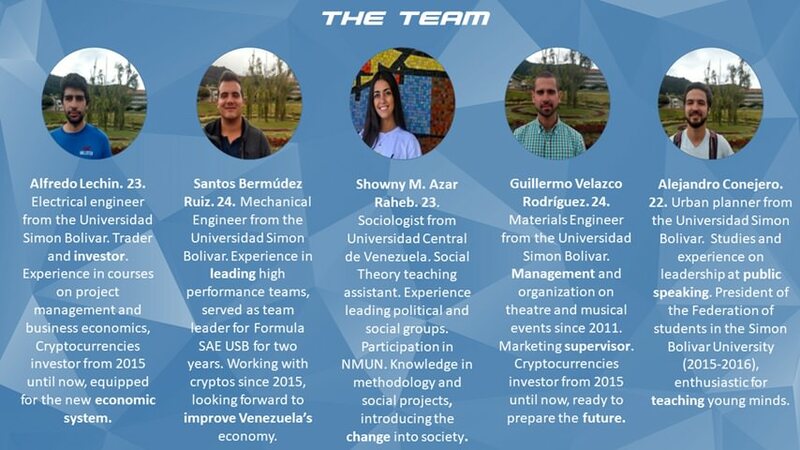 Actually Alejandro Echaverria from DASH Help and Eugenia Alcala from DASH Caracas and DASH Venezuela are our two main advisors on this proposal. 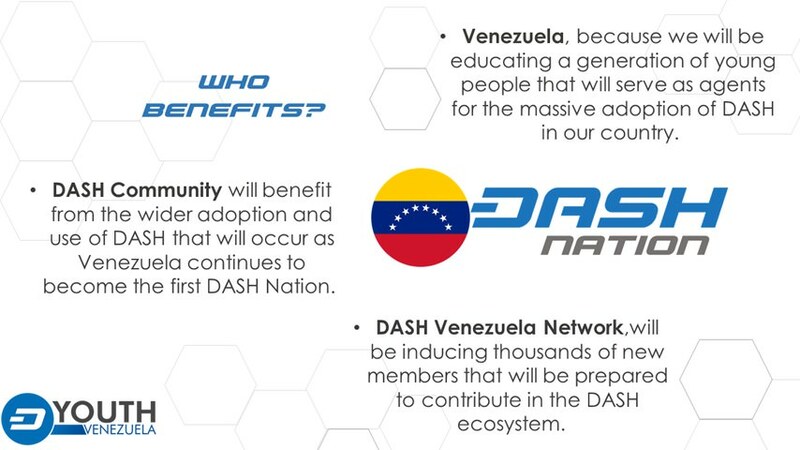 In addition to that, we also contacted virtually each and everyone of the other DASH projects that currently exist in Venezuela since we believe that working together and towards the same goal is a must if we want Venezuela to become the first DASH Nation. OK if Alejandro and DASH HELP Venezuela and Eugenia are backing you then this is an easy decision. Fully agree. Looking forward for it as well and of course you got my support. This is a exciting project. I recommend that MNOs assessing this project click on the "Show full Description" button above. The team have created some great looking infographics for their project. I think this project is going to go Viral across the youth of Venezuela. The price of the project is very well priced for what they are going to achieve. They are backed by well established Venezuela project leaders like Alejandro from DASH HELP Venezuela and Eugenia from DASH Caracas conferences. This proposal is very exciting and how you plant to get the message out to so many students. 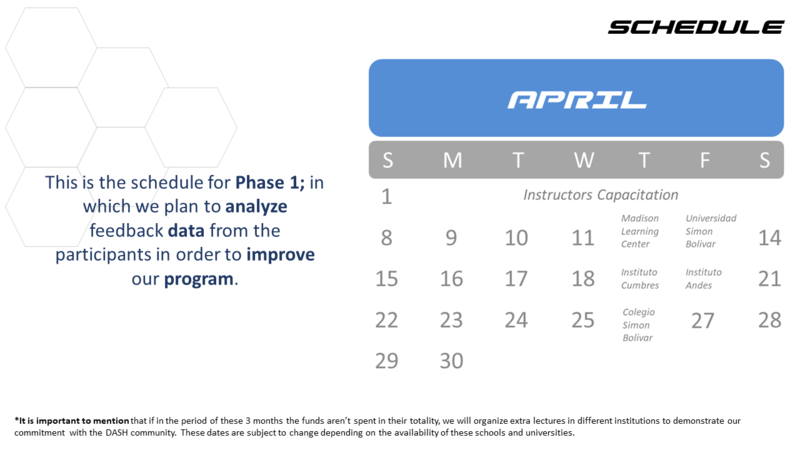 I would like to also suggest a few ideas that would add even more value to this proposal and could lead to all students in Venezuela learning about DASH using your program. How could you design your training to make your teaching go "viral" among the all youth of Venezuela? What could you do in your training to achieve this? Stage 1: Give the students a vision of what the ultimate goal is. Establish DASH as a stable currency in Venezuela to solve the currency crisis and make sure they understand their responsibility in this vision realisation. Each person, no matter how insignificant they believe their role to be has a responsibility to solve the currency crisis in Venezuela. 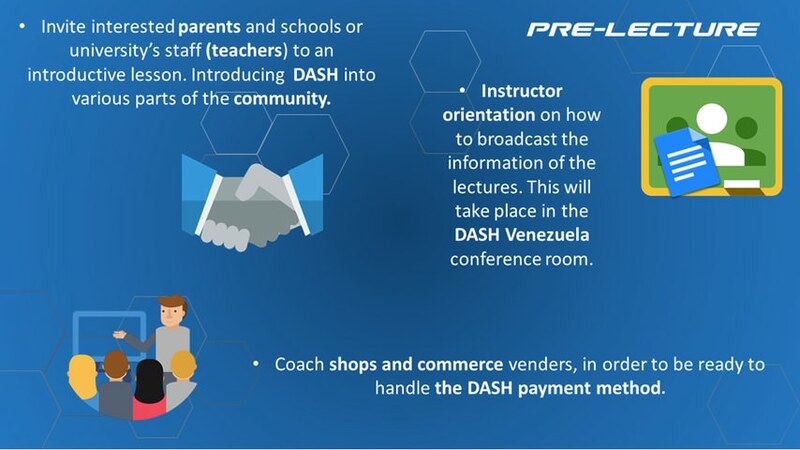 Stage 2 is to provide the training on the fundamentals of DASH and how it can be used as a sound and safe Currency in Venezuela. This is the stage where people are trained to understand what DASH is, what DASH does how DASH can be used What the benefits are of using DASH, Why you can trust DASH and finally how to start using DASH. Stage 3. The students that are educated in Stage 2 now need to also understand they have a responsibility to educate others just as they have been educated. If you could achieve this in your course e.g. how to become a "Viral Agent" in spreading the word about DASH to others. You could also give a module of training on how to do that as part of your course. Stage 4. Support the "Viral agents" show them what to do and give them the resources to do it. Build a strategic plan for how the viral education program across Venezuela will work. Stage 5. Execute the viral program. 1. How can design you design this project to make it go "viral" across all of Venezuela? 2. How can you leverage this project to have even greater reach to many more people? 3. What strategies could you implement to actually generate revenue to support the viral spread of DASH through this educational program? First of all, we truly appreciate the time and effort you took digesting our proposal and its benefits. Now, regarding the suggestions you have about our project, we tried to point out a few things we already had in mind and tried to enclose some of the points you made. Initially our idea is to resolve the most common fears and mistakes general public has about DASH; security, stability and efficiency, adding to this the benefits DASH offers. We plan to make them understand how it operates and point out the differences between DASH and other cryptocurrencies. But why DASH? We will show growth and other benefits from the others (Instant send, low fees, security, between others) and also let them know about the influence DASH already has in Venezuela. 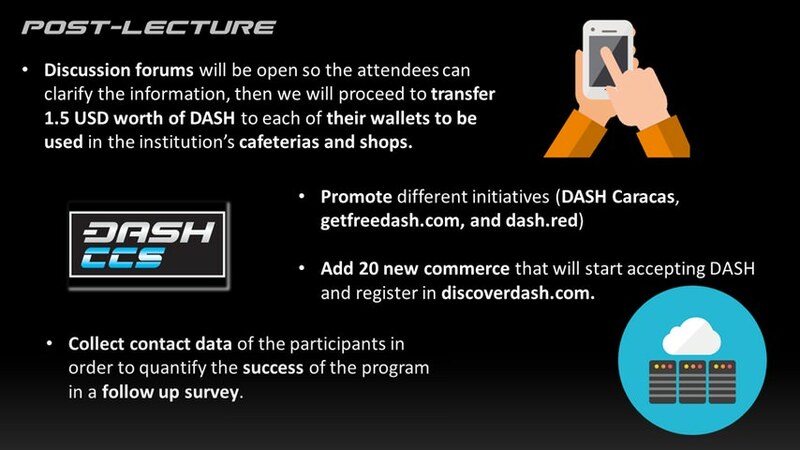 But this is not enough so we plan to show them how easy and efficient it would be to use DASH as CASH by transferring a DASH giveaway in their recently downloaded wallets for an “after the conference” payment activity in the different commerce of their institution, whom will be previously coached on how to use and receive DASH. Also we will lead these students to our web site, in which they will be able to learn about DASH profoundly, how to join and help the community and also they will be guided to the current programs, such as exchanges (DASH/Bs.F.) or events related to DASH. So they will be motivated to become DASH adopters and spread the word about how great it is. Thank you very much for the ideas Deepblue, they are really insightful and certainly aligned with what we are aiming for with this proposal! Please be assured we will be brainstorming to generate solutions to the topics you are bringing to our attention. Great project guys. Yes from me. Good idea coming from a coutry that is going viral with cryptocurrencies and DASH in particular. Voting yes! and monitoring future progress of this initiative. Thank you very much CRServers!! Hopefully we will be starting operations next month and we would be please to inform everyone on the network about our progress.